1988-Masciandro and Tabellini: According to the research done in five developed country there was found to be a negative relationship between the independence of central bank and the inflation level of the country. 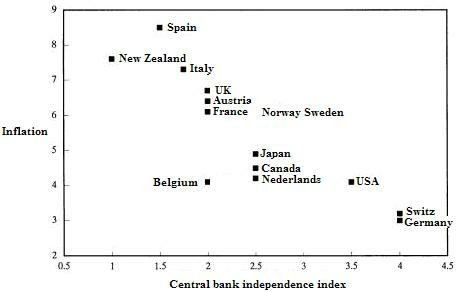 1991- Grilli: According to the analyses done in 18 OECD countries between 1950 and 1989, there was found to be a negative relationship between the independence of central bank and the inflation level of the country. 1992- De Haan and Sturm: According to the analyses done in 18 OECD countries between 1961 and 1987, there was found to be a negative relationship between the independence of central bank and the inflation level of the country. 1992-Cukierman: According to the research done by Cukierman, the legal independence was found to be critical in developed countries. Nevertheless the same results were not found in the emerging economies. 1993-Pollard: According to this research the main faults of the studies other than Cukierman, are the assignments of equal weights for different factors. 1997-Loungani and Sheets: These analysts analyzed more than 25 transition economies and found a negative correlation between the inflation and the central bank independence. 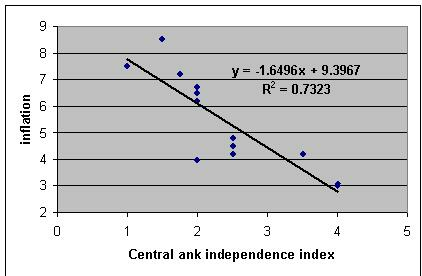 According to the above researches there was found to be a negative correlation between the central bank independence and the inflation level. When we analyze the figure below, we can see that the inflation rates are smaller in the countries which have more independence of central banks. According to the same data when we want to make statistical analyses we will try to understand the quality of the relationship between the central bank independence and the inflation. To understand this, we can make a linear regression analyses in excel. In that analysis we found the following figure. As we know from statistics, the coefficient of the x value shows us the direction of the relationship. Since it is -1.6496, this means that the possible relationship is reverse proportional. After that value we must look to R2 value which shows the strength of the relationship between these items. Since R2 value is 73%, we may say that there exists a reverse relationship between these factors. Özlem Arslan, “Avrupa Birliğini Oluşturan Ülkelerde Merkez bankası Bağımsızlığı, Enflasyon ve Diğer Makro Ekonomik Büyüklükler Arasındaki İlişkiler: 1980 – 2001 Dönemi”, (Thesis, TCMB, 2003), p. 28.